Recycling paper in offices is such an old story you’d think we’d have it nailed by now. We haven’t. In my experience recycling bins in offices create only one type of behaviour; passive-aggressive all-staff notes about how the bins are being used incorrectly, or not at all. So why are they not used as the facilities manager expects? Because (like most things in life untroubled by a behavioural understanding) navigating the ‘user options’ requires so much cognitive load the act of recycling is closer to a school exam than a simple bin-drop. This can be changed. Should be changed. Especially as the answers are fairly simple. And they are here. In England the volume of waste that goes to landfill is over 45%. In Germany 1% of waste goes to landfill. In the USA, recycling rates are between 30% – 50% depending on the material (40% of physical space in US landfill is paper according to the EPA), and most of it’s done at home: offices lag. There’s definitely some work that can be done. Over 60% of employees polled for Green Office Week say lack of empowerment, facilities, and communication are the key reasons why they’re not greener at work. Green Office Week is a flimsy carapace for Avery the office stationary people to ‘own’ greening the office (yawn) using a headline week (the perfect way to make it seem like an outsiders’ activity) that delivers information which (massively incorrectly) appeals to cognitive reason, and attitude. So, how do we do this bin stuff? James Kimmel of the Innovative Economics Initiative blog experimented with the ‘landfill’ label at the University of Pittsburgh (as documented by Fast Company Magazine too). For two weeks he had a yellow ‘landfill’ label (which included a smaller reference to the local landfill center where the rubbish would be taken) on general waste bins. Overall recycling rates increased by 29%, and discarded recyclables decreased by 23%. Increasing recycling is one thing, but decreasing the rate of misplaced goods is vital, especially if food waste is involved. James hit on something that the National University of Singapore had, too. ensuring those who are unsure, unwilling, or uninterested have an option that doesn’t ruin the efforts of those that recycle. Why might we be unsure, unwilling, or uninterested? Is it an attitudinal thing? Usually we throw things away while we’re doing something else – like chatting on mobile phone, chatting to friends, or thinking about where we’re going. And it’s this system 2 cognitive load that defers decisions to our impulsive system 1 thinking. How do you deal with that? 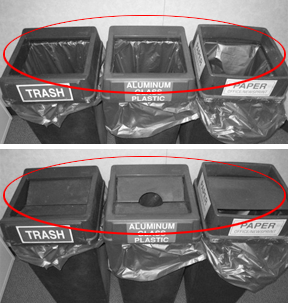 Plenty of studies into recycling have been done, but none focused on the shape of the bin. Does this make a difference? Sean Duffy and Michelle Verges (at the time, respectively, associate professor of psychology at Rutgers–Camden, and assistant professor at Indiana University) can tells us. They experimented by arranging bins side-by-side in ” . . . shaped bin lids reduced food-waste contamination by 95%. Ninety. Five. Per. Cent.”groups of three. They were all prominently stickered as ‘Trash’, ‘Aluminum-Glass-Plastic’, or ‘Paper’. Some groups-of-three all had open lids, replicating standard waste containers. Other groups-of-three had shaped lids: the ‘Trash’ option had a push-able flaps; ‘Aluminum-Glass-Plastic’ had a push-able flaps with a circular hole cut out of the centrer mirroring the shape of the expected drinks containers; ‘Paper’ had a lid with two slits. There were two sets of results: the first was amazing. 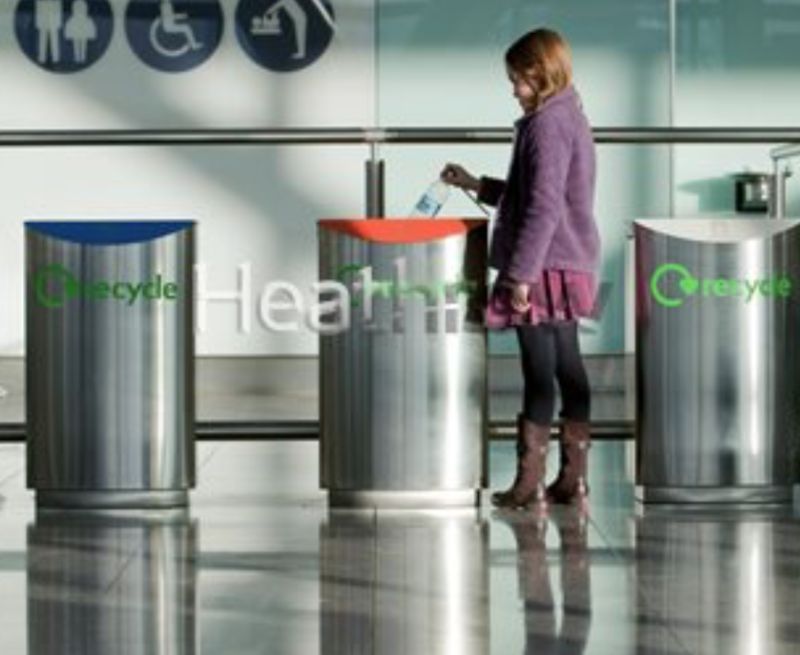 – The shaped bin lids were shown to increase correct recycling by 35%. That is a huge jump – rates of increase in the single digits would be received with excitement. But 35% is great. However, it’s overshadowed by the second set of results: if the first were amazing, the second were astounding. – The shaped bin lids reduced food-waste contamination by 95%. If you’re going to do only one thing, then this is it. However, it’s hard to get away from the fact that they’re only retrospectively functional compared to Duffy & Verges shaped lids which shout ‘Yo! I’m for paper/cans/waste’, simply by the look/shape of the bin. The most important thing about this approach? It works today, tomorrow, next week, next month, next year, and even next decade. Don’t do a green week. Don’t appeal to the rational. Do examine behavioural insights. (Hat tip to Civilian Agency, from whom I saw a tweet about the Green Office Week. Hi Oliver – really useful and interesting article – one question that occurs – the examples you gave were all run seperately – is there an example which combines all three ideas (name, pair and shape) or would that not work? For example would people opt out of the extra cognitive load caused by shaping, if there was an easier option available, the paired trash bin? Excellent Blog!! I am impressed by your blog. It’s very informative and useful. Thanks for sharing.